You can mute one or several audio tracks in your project. In the Timeline view, near the left edge of an audio track, click on the Mute / Unmute button. The Mute / Unmute button will display a "muted" icon. The next time you play your animatic, you will not hear this audio track. 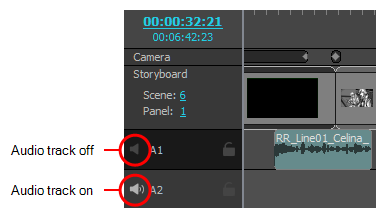 If you want to unmute the audio track, click on the Mute / Unmute button again. The Mute / Unmute button will display an enabled icon again. The next time you play your animatic, you will not hear this audio track. TIP When all audio tracks are enabled, you can instantly mute all but one audio track by holding the Alt key and clicking on its Enable / Disable button. You can also instantly enable a single one of your audio tracks by enabling Solo Mode—see Using Solo Mode with Audio Tracks.